Discover the economic impact provided to Nebraska by the trucking industry. From employment opportunities to tax funds, as well as what would happen to the state without the trucking industry. We thank each of our Cass County members for your dedication to the communities you serve. Without trucks, Nebraska stops. In Nebraska, the key commodities carried by truck are farm products, livestock, animal feed, processed foods, building materials and petroleum products. Hospitals, supermarkets, manufacturers, shopping centers, hotels and schools depend on trucks for daily delivery. That’s a lot of responsibility. 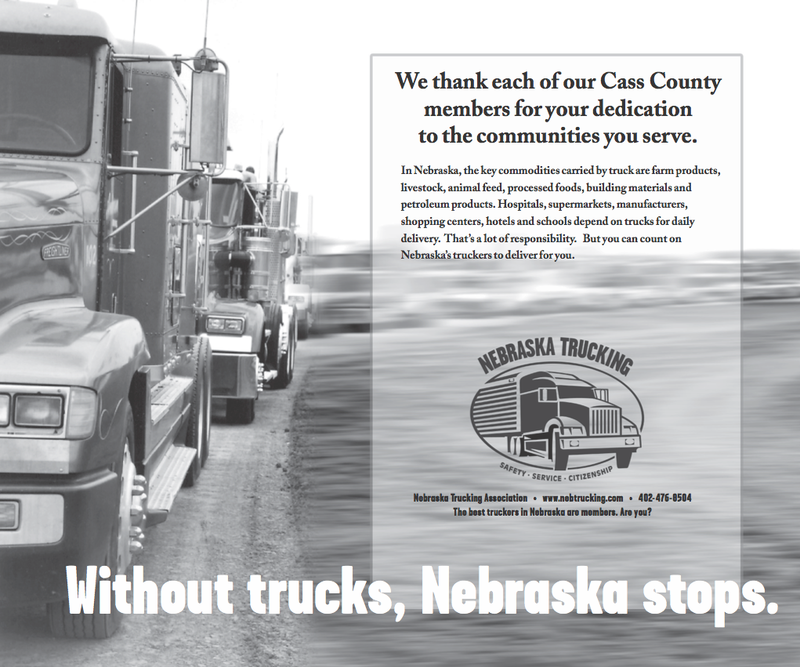 But you can count on Nebraska’s truckers to deliver for you. The Nebraska trucking industry employs one out of every 12 workers in the state, providing 62,970 jobs. Total trucking industry wages in Nebraska exceed $2.7 billion, with an average salary of $42,512. Truck drivers held 30,860 jobs with a mean annual salary of $34,660. Nebraska’s trucking industry pays approximately $302 million in federal and state road taxes and fees. Trucking paid 45% of all taxes and fees owed by Nebraska motorists, even though trucks represent only 13% of vehicle miles traveled. Trucks transport 76% of total manufactured tonnage in Nebraska. Over 48% of Nebraska communities depend exclusively on trucks to move their goods. Gas stations would run out of fuel in as little as a few hours. Manufacturers would experience component shortages and manufacturing delays in as little as three hours. Hospitals and assisted care facilities would run out of medical supplies such as syringes within 24 hours. Grocery stores would experience shortages within 24 to 48 hours. And in just a few days, we would be surrounded by uncollected garbage and medical waste.